Relive the past glories of the Lions – or surprise your favourite die-hard Brisbane fan! Features both action images of the stars in full flight, and celebration images from Brisbane's 2001, 2002 and 2003 Premierships. 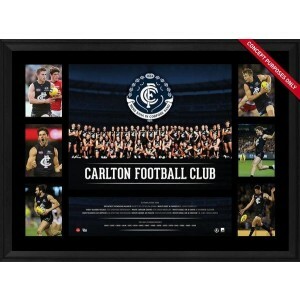 This stunning framed piece celebrates the amazing Carlton and its 2016 season. Including their 2016 team photo, along with the club's 2016 playing fixture, with the names of each of the players listed below. This is perfect for any true Carlton Football Club fan wanting to own a piece of Blues history. 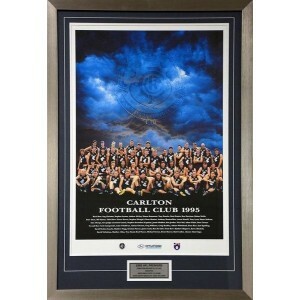 This stunning framed piece celebrates Carlton's AFL Premiership wins over the club's history. Including their 2016 team photo, along with imagery of the team's star players, this is perfect for any fan wanting to remember the club's past glories, with the premierships and club records listed. This is perfect for any true Carlton Football Club fan wanting to own a piece of Blues' history. This framed poster celebrates the 1995 Grand Final where Carlton beat Geelong 141-80. Surrounding the poster is matting and a plaque with the match details. This is definitely a collector’s item for all Blues fans. Please note: This item is available in most teams/years. Please contact us if you'd like a similar piece for your favourite team. Secure your piece of Blues history! It is not every day that the AFL release memorabilia which surpasses all pieces in its field, in detail, complexity and grandeur. It is not every day that the AFL get to release a product that has taken more than fifteen months to produce, such were the requirements from conception to completion. It will no doubt be a long while before anyone can hope to emulate this magnitude of memorabilia. It is with great privilege that we present to you... Carlton ‘Glory Days’. With sixteen flags thus far, there is no club in the VFL/AFL with a more successful history than Carlton. On the biggest stage of all, legends in Navy Blue have been born, commanders have become champions, and warriors have become heroes, with the unwavering belief that strength and might is borne from unity. Every sacrificial act, every extra effort and every refusal to yield an inch is as inspiring to teammates as it is to fans. This attitude has been the backbone of the Carlton success story, and will undoubtedly continue in the years to come. Unparalleled in its prestige, the AFL are proud to release ‘Glory Days’, the comprehensive, definitive premiership tribute. 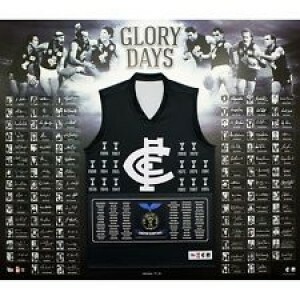 ‘Glory Days’ lists every single premiership player in Carlton’s history, and is personally signed by no less than 88 living premiership players. Features both action images of the stars in full flight, and celebration images from Collingwood's 2010 Premiership. This stunning framed piece celebrates Collingwood's AFL Premiership wins over the club's history. 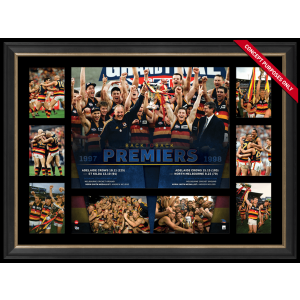 Including their 2016 team photo, along with imagery of the team's star players, this is perfect for any fan wanting to remember the club's past glories, with the premierships and club records listed. This is perfect for any true Collingwood Football Club fan wanting to own a piece of Magpies' history. Darren Millane is still widely regarded as one of the best players to ever play for Collingwood. 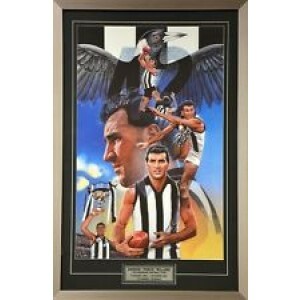 Featuring a plaque with his career statistics and nicely matted border, this piece is a must for any Magpies fan. Secure your piece of Collingwood history!